Complete food for older dogs. 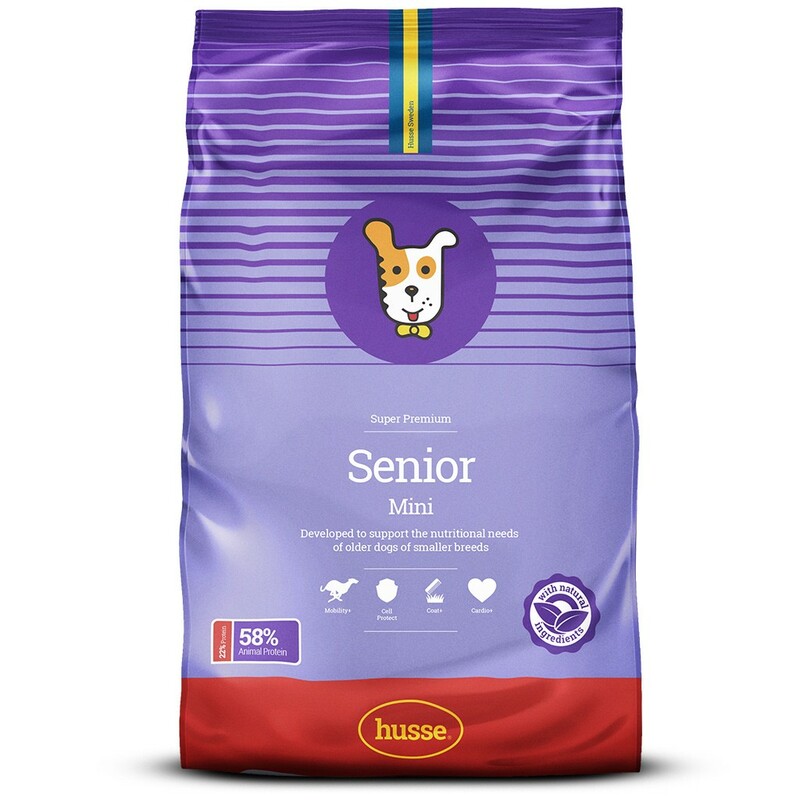 Husse Senior Mini contains only the best ingredients with high digestibility and a high nutritional value. 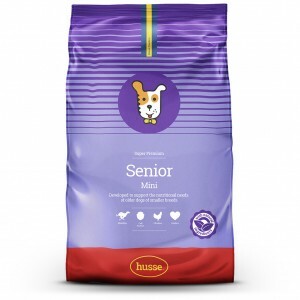 Senior is specially developed to satisfy the nutritional needs of older dogs. 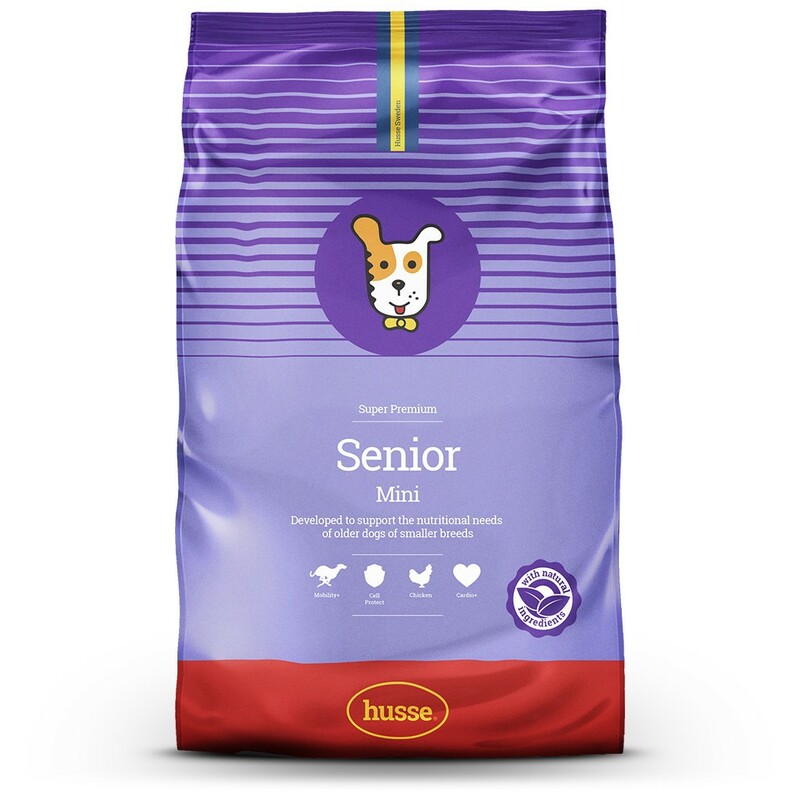 Husse Senior is the ideal food to keep older dogs in good shape. A lower fat content helps to control their body weight. Enriched with chondoitin and glucosamine for healty joins and taurine for support of heart function. Taurin supports heart function and is important in the nutrition of older dogs. Enriched with vitamin D to increase absorption of phosphorous. Fructo-oligosaccharides are sugars that stimulate the beneficial flora to support digestion. Vitamin C is one of the most important biological antioxidants. The combination of vitamin A, C, E and grape seed extract supports the dog's immune system and helps prevent cell aging. Salmon oil (optimal ratio omega- 3/ omega -6) contributesto a healthy skin and coat, and stimulates appetite. Green mussel extract is a source of chondroitin and glucosamine that are components of the cartilage in the joints; these substances support the cartilage for supple joints. chicken, wheat, rice, wheat meal, beet pulp, animal fat, fish, linseed, hydrolysed chicken protein, whole eggs, salmon oil, yeast, fructo-oligosaccharides, salt, lecithin, Tagetes, sea algae, grape seed. protein 22.0%, fat content 9.0%, crude ash 5.0%, crude fibre 3.0%, calcium 1.0%, phosphorus 0.7%, taurine 1000 mg/kg. Nutritional additives: vitamin A 16000 IU/kg, vitamin D3 1600 IU/kg, vitamin C 200 mg/kg, vitamin E 450 mg/kg, E1 (lron) 160 mg/kg, E2 (Iodine) 2.5 mg/kg, E4 (Copper) 6 mg/kg, E5 (Manganese) 50 mg/kg, E6 (Zinc) 86 mg/kg, E8 (Selenium) 0.16 mg/kg, beta carotenen 1 mg/kg, chondroitine-glucosamine 1000 mg/kg; Antioxidants: tocopherols.